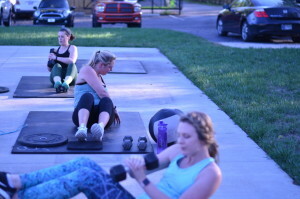 “I started Broad Ripple Fit Club in the fall of 2013. I had recently turned into a “grown up” and was dealing with the sucky side of it: bmv, taxes, doctors, bills, responsibility, bills, bills…….and weight gain. I had gained around 30lbs since I graduated college. I was so embarrassed. I knew I had to make a change and it had to be a serious one. That’s when I found Broad Ripple Fit Club. My first assessment went as well as I expected. I didn’t feel like I was going to die, but I knew it wasn’t going to be easy. I spent two weeks in the 101 class and at the end of August I was ready for my first class. I was a wee nervous but also excited. I was ready to run the Monon for our first WOD and about 10 steps into my run I tripped on a rock and sprained my ankle. Honestly, I just wanted someone to put me down. Jeff had to actually carry me off the Monon. I was mortified. A few weeks later I swallowed what little pride the Monon had not stolen from me and I went back. This was the best decision I’ve ever made. A year and a half later I’m 25lbs lighter, stronger and more confident than I’ve ever been in my entire life. 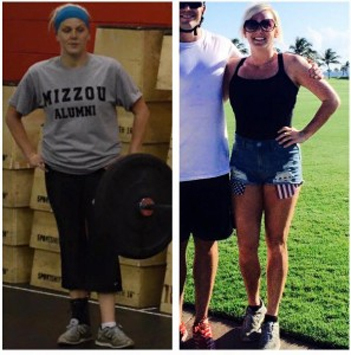 Crossfit is still a continuous learning experience for me. It’s always hard and always makes me push myself, which I love (and I need). I don’t care about being “skinny” anymore, because I’d rather know I can back squat your boyfriend or push press your grandma. Are You the Hero of Your Story?